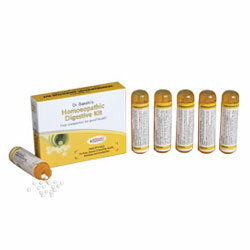 Bakson's Homoeopathic Digestive Kit Treats Colic, Nausea & Vomiting, Acidity, Diarrhoea and Constipation. A non habit forming formulation for Constipation of various disorders. For travel sickness, morning sickness and Nausea & Vomiting in general and of drunkards. For colicky and spasmodic pain in abdomen associated with flatulence and constipation. Children : 3 pills, 3 times a day. In acute/severe cases 4 pills every 2 hours, 6-8 times a day, may be taken.